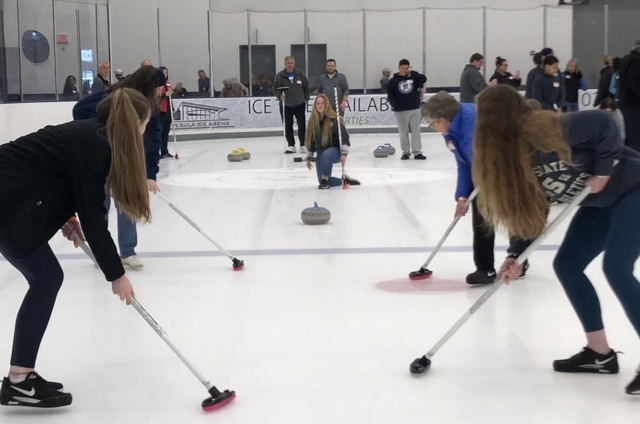 Penn State club curler Aine Kirwan throws a stone as her mom and two sisters help sweep the ice helping to guide the stone along. Kirwan’s family came up from Virginia to learn the sport at a public learn to curl event at Pegula Ice Arena. UNIVERSITY PARK – I am going to start this off by saying, first and foremost, that curling is lot of fun, but it is much harder than it looks on TV. After trying it for the first time at Pegula Ice Arena during a public learn to curl event held by the Penn State Curling Club, I can say that my last hope for Olympic glory has been crushed. But I sure had great time giving it the old college try and recommend that anyone interested get out there give it a shot. It seems like every four years, during the Winter Olympics, I hear it from my family and friends who are enthralled watching teams from around the globe glide round stones down ice and sweep away trying to get that stone into the right position. It seems like people just can’t believe that this game — that looks like shuffleboard on ice — is actually an Olympic sport. It just looks like such a fun thing to do, like bowling at a really cold bowling alley. After the 2018 PyeongChang games, a group of Penn State students took their interest in the game and did something about it. They saw the wonderful ice at Pegula and, with some gumption, started their own club, which soon became the largest student curling club in the country (we are talking about Penn State after all. If we do something, we do it big). After a successful season, the club invited the public to come out and give the sport a try, with three sold-out sessions. So on a beautiful and warm spring day, I headed to the cold confines of Pegula to learn how to curl along with my editor G. Kerry Webster and publisher Bernie Oravec. I think we were all excited to give it a shot, but once we got there I know I felt a little nervous about the matter. Seeing the 40 pound stones and the great distance that they needed to be guided down the ice kind of put things perspective. We started by taking “Curling 101” with our curling instructor, club president Bobby Torres. Torres explained the simple rules of the game, and they are quite simple. I don’t know why but it always seemed more complex watching the game on TV, but as Torres explained, the ultimate goal is to get your stone as close to the middle, of an area across the rink called the house, as possible. Most of the bullseye type circles of the house are just arbitrary lines used as reference points. All that matters is that your rock is closest to the middle of the house, which called a button because the old Scottish guys who invented the game would place a button on the ice to mark the spot. If you leave your team’s rock closer to the button than your opponent, then you score. Before we got on the ice we were each given a grippy covering for our less dominant foot that provided traction on the ice. It worked really well and I felt very secure on the ice. When curling, the ice is sprayed with a light sprinkling of water giving it small bumps, adding some extra traction, but it is still plenty slick. In order to glide the heavy stones down the ice, they need a good push, and getting them moving on the ice is no easy feat. For the delivery, players put their dominant foot in the hack, which is like a starting block to push off on. Throwers then place their other foot on a glider— which is exactly like it sounds — it lets that foot slide on the ice. It is very slippery. I almost slipped and fell a few times with a glider on my foot, but luckily managed to stay on my feet. Junior Brendan Leibross was very patient and encouraging as we worked through the delivery motion. He had us crouch down at our hips and after inching the stone backwards we pushed off and lunged forward to glide down the ice while guiding the stone with us. You needed to get a good push to have control with the stone. If you turn the stone slightly it will bend or curl in a certain direction, maneuvering around other stones and into the correct position. I just tried to stay upright and get that stone down the ice with my throws, and figured I would save the curling for the experts. After the throw, sweepers use the brooms to smooth out the little bumps on the ice to help the stone continue to guide. Sweeping is really hard and provides a good workout. The trick is to put your whole weight on the broom and push with all your might into the ice if the stone needs momentum to reach the house. Sweeping is made more difficult because you are trying to stay upright as you glide down the ice with a 40 pound stone coming at you. You don’t want to fall and get hit by that thing. My first throw only made it halfway down the ice and I felt a little defeated, but I figured I would do better sweeping and it was pretty cool when I was sweeping a stone thrown by someone on my team right into the house. Score! We were playing with Cindy Anderson and her two daughters Brigit and Mave Kirwan. They came all the way from Virginia because Cindy’s other daughter, Aine Kirwan, is the outreach coordinator for the curling team and they wanted to see what she has been talking about all year. Cindy struggled a little on the ice, but she had a lot of fun with her daughters learning the new sport. “Learning how much effort it actually takes to make the stone get to the other end was interesting,” said Anderson. Brigit was not a fan of sweeping, but enjoyed her time nonetheless. “It was really hard. There is way more cardio involved than I thought. But it was a lot of fun,” said Brigit. Mave laughed because she fell often, and said that it was a lot of fun giving the new sport a try with her family. All were amazed at how Aine picked up the sport. Aine’s dad was also at the event and she was glad to see them all come together and try something new. For her, curling was a way to try a new sport and meet interesting people. “I found something new and unique … something interesting. Something you only see once every four years at the Olympics — a novelty. I said, ‘why can’t I do that?’ And now I do it,” said Aine. The newly formed Nittany Valley Curling Club is going to soon proving more curling opportunities for the public on Saturday afternoons with a beginner "learn to curl league," drop in curling and other curling opportunities, along with member events, so there is chance for the whole community to be like Aine and try something new. During the session, I got one last stone to throw and I tried to think of everything that Leibross had told me as I stood on the hack. I pushed off and let go of the stone and it was going where I wanted it to. My sweepers worked hard and it was looking good. I was overjoyed as it made its way to the house only to see it stop just outside of the mark. Nevertheless I felt it, the surge of a good throw, and I think with practice I could do it again and again. It certainly is not easy, but it sure is a lot of fun.